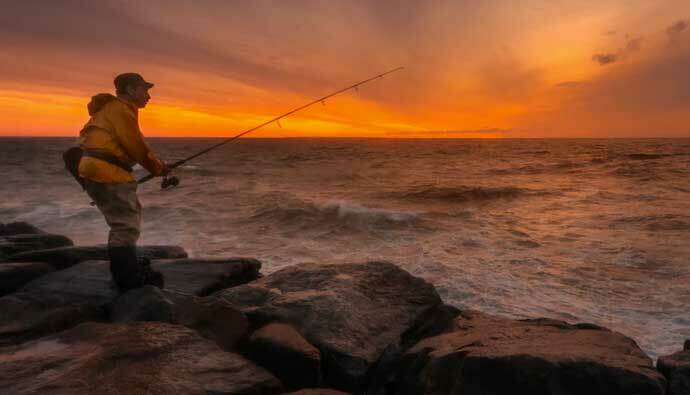 Surf fishing is one of the best hobbies you can have…simply for the sunsets and the excitement of having tight lines. As the waves crash on your legs, you feel the tip of your rod start to quiver. Is it a ray? Could it be a shark? Maybe it’s a halibut?! The excitement is almost too much to handle as you reel it in fast. It’s a surf perch…Well, at least you got a bite! Send it back and keep the casts flowing. 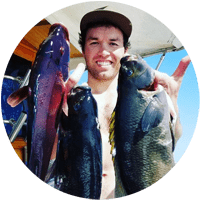 If this sounds like something that you’d like to try, then the first place to start is by understanding the surf fishing gear needed to catch fish. I’ll start off by saying that there are endless combinations of gear choices and ultimately it’ll come down to your personal preference after you try out different items. In this article, we’re going to dive into some of the surf fishing tips I use and what others who surf fish like as their go-to setups for easy surf fishing. 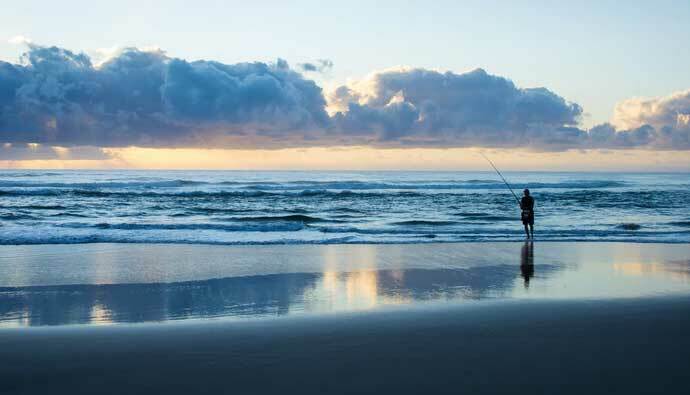 Whether you’re a beginner or a more seasoned surf fisher, this guide will help make sure you have everything you need for a fun day out in the sand. Let’s get started and see what you should have in your surf fishing gear setup. Looking for a serious surf fishing rod? If you decide you want to heave out a huge piece of bait far out into the ocean and wait for a fish to come by and take it, then you’re going to want a large pole. This method requires a pole 10 feet or longer, with most topping out around 15 feet. This size pole will take some getting use to for casting, so your first few times might be unpleasant. Also, note that you’ll need to have plenty of space in front and behind you to cast it without having anything obstruct your action. This size fishing rod tends to be a bit heavy so you won’t be holding the pole for long while waiting for the fish to bite. It’s better to place the pole in the sand, a holder, or leaning up against a structure until the fish bite. Depending on the structure of the beach, there might be a trough that drops from around three feet to say 20 feet. That’s usually where the larger fish are active and that’s simply too far for a smaller pole to cast out there. You’ll need to use heavy weights to be able to cast out far. With 3 ounces of lead, it’s not uncommon to cast it out 250 feet or more. When using a big rod, it tends to be harder to feel when a smaller fish is on the line. This isn’t a big problem if you’re leaving the rod in the ground and waiting for a solid bite before reeling in. It’s not uncommon to see videos of anglers pulling in massive sharks from the beach using large rods. If you’re interested in trying that out, make sure you get the appropriate line that can withstand their sharp teeth. Fan casting is a fun way to get in the water and try many areas quickly. If you want to be more active surf fishing then you should try getting a medium to short rod to hit the troughs where the fish are near shore. If you don’t know how to spot troughs, then you can try fan casting which is throwing out in different areas up and down the beach to hopefully hit an area where fish are at. 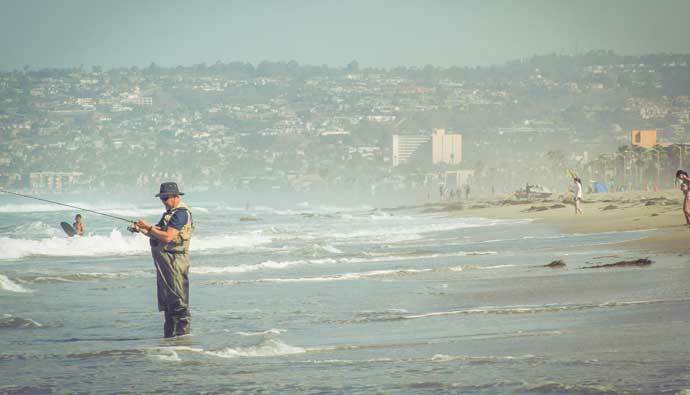 When you’re surf fishing, you’re going to be dealing with the harsh saltwater and sand that will damage anything that moves…and since reels have moving parts, it’s important to opt for quality. Looking for a quick pick reel to get started? This is a common style of reel, especially for beginners. They are easy to use and are robust depending on the brand and style you choose. The size of reel you choose depends on the size of fish you’re going after and the size of rod you’re using. When to use: It’s good to use a smaller reel when you’re surf fishing since you’ll be holding your rod and reel for long periods of time. Since you’re not casting super far with a short to medium length pole, a small reel will have plenty of line for most fish you catch. When to use: These rods are great when you’re going for the larger fish and need a little more line than a smaller reel. These reels work well for rods larger than 8 feet and can even be used for dropping line off a kayak or small boat. When to use: Large reels can massive, however for surf fishing you probably won’t need anything greater than 8500. These reels are huge and will most likely be used for large poles where you need to cast out far and put the pole in the sand while you wait for the big fish or shark to come by. Conventional reels are great for distance casting at the beach, especially if you want to go for sharks and other big fish. Conventional reels require you to lay down the line yourself using your finger, which can take some practice. Some come with a star wheel drag or lever drag depending on the manufacturer. The biggest challenge most new surf fishers have with conventional reels is their tendency to birds next if you aren’t careful placing your thumb back on the spinning spool near the end of your cast. However, once you master this, you’ll be able to cast farther than a spinning reel due to the reduced drag design. Some conventional reels come with magnetic brakes which tend to be better than centrifugal brakes. If you’re going to use a big surf fishing rod, it’s worth trying a conventional reel to get the most distance out of your casts. 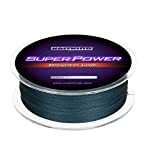 There’s a host of fishing line setups for you to choose from, but the common line options are braid and monofilament. Nothing beats being out in the ocean with a line in the water. Looking for a quick pick line to get started? Mono tends to be cheaper than braid of the same breaking strength. Expensive doesn’t mean braid is the clear winner, it depends on the application. Mono is the clear winner. Anytime mono is rubbing against something sharp like a rock, it tends to wear but not snap instantly unlike braid. Mono definitely stretches more than braid. This is important if the fish you’ve hooked has a soft mouth and you need some leeway during the fight to prevent the hook from pulling off. Some anglers like braid for artificial lures since it doesn’t stretch giving them the sensitivity and responsiveness they desire. Braid is significantly thinner than mono for the same breakage strength. This means you can spool more braid on a reel than you can with mono. This is beneficial in that you can use a smaller reel which weights less and won’t make you tired after a long day of fishing. Braid is thinner which means you can cast them farther than mono. Some empirical tests show that braid gets at least 7% further cast than mono. The new trend in surf fishing is to braid back at least half your spool and top shot the rest with mono. This means you’ll be fishing primarily with the mono since you most likely won’t be using the full length of your reel, but you have the security of knowing if you do catch the big one you have the line necessary to bring the fish in. This is helpful also when you want to replace the cheaper mono and keep the braid on there since it’s barely used. This saves you money over the long haul, plus you get to use a smaller reel when otherwise you’d need a bigger one. Many anglers like to use a fluorocarbon leader because they are ultra clear and make it hard for fish to see the line. They also sink more aggressively than mono or braid which is nice when trying to get your line down below the water line. Fluorocarbon tends to be more expensive than mono as well. Depending on where you’re fishing and the conditions, your tackle needs will be different. Below are some general tackle items that should work for a majority of surf fishers. Looking for a quick pick saltwater lure to get started? When it comes to weights there are different styles depending on how you want your bait to behave in the water. Most anglers will use a 1 to 3 oz bullet, slip, or pyramid sinker to get their bait far out beyond the breakers. If you’re going for a halibut or want to get a fish’s’ attention, then add a colored bead between the weight and the swivel. Red and orange tend to work well. If you’re using a swimbait, then check out the ½ and ¾ oz jig head weights that come with an integrated hook to hold the weight to the bait. You’re going to want a bunch of different hooks depending on your setup needs. You should have at least ten of each size between 4 and 8. Get the different styles such as the mosquito, bait keepers, octopus, etc. As for colors, red and black seem to do well, but I’ve caught on pretty much all colors in the past. You can never have enough soft bait lures to test out in your waters. I’ve had great success catching small to medium size fish using Berkley GULP! Camo Sandworks (2-inches) and Big Hammer Perch Grubs in Motor Oil Red Flake and Motor Oil Red Flake and Green colors. Get a wide variety of colors and type to try out since it depends on the water conditions. If the area you’re fishing is murky, then get a dark colored bait. If the area is bright and clear, then try some vibrant colors. Certains species don’t go for the soft baits which require you to spend some money on the hard baits. Now that we’ve covered all the essentials for surf fishing, it’s time to dive into the various nice-to-haves to make your life comfortable. For beginners, most of these items are not needed until you spend more time in the water. Sand spikes are plastic, wood, or metal rod holders that you drive into the sand. If you’ve gone to the beach and seen a large fishing pole pointed near vertical in the sand, it was most-likely supported by a sand spike. These come in handy to keep the line high up so that people can walk along the beach without being clotheslined by fishing line. They also make it convenient while you wait for a fish to bite without your pole flying off towards the ocean. Buckets make great seats while you’re waiting for the big ones to take your bait. If you’re fan casting then it’s nice to have a bucket to throw the keeper fish in with some ice. This helps you not get all the fish juices on the inside of your car. If you’re using live bait then keeping them in a bucket is helpful, especially if you pick up a cheap aerator to oxygenate the water. It helps to transport your gear from your car to the beach without you needing to carry anything in your hands except your pole and bucket. Looking for a quick pick tackle bag to get started? Not just any backpack will do. There are a host of fishing backpacks and tackle bags that will make your fishing day a joy instead of a nightmare. Looking for a quick pick fishing pliers to get started? Nothing makes you feel guiltier than having a fish swallow a hook and you can’t remove it because you don’t have pliers to get deep in there. Pliers help you remove hooks easily and are a must-have for the ethical angler. Measuring tapes are handy to measure your fish after it’s been caught. If you want to keep your fish then it’s important it’s of legal limit and without a measuring tape, you’d never know. Even if you catch and release, measure your fish so you can keep track of the biggest ones you’ve caught of each species. These come in handy to cut line, especially when you’re removing excess line around a knot. Some anglers opt to use their teeth…however, these are more effective. Pick up a cheap clear container with dividers to store your tackle. This helps you keep it organized and easy to access when you need to swap out or replace your rigging. A common way to organize is to have three small containers, one for your soft lure packages, another for your various hooks, weights, leaders, etc, and a final one for your hard baits. If possible, get different colors to help you easily identify each container in your backpack. Sometimes rinsing your hands in the ocean after catching a fish can’t get all the slime off. If you have a cheap old towel, it’ll help get your hands dry and slime-free so you can get back after it. Just note, don’t hold the fish with a towel since it’ll remove their natural slime and could lead to disease or illness for the fish. Fishing is better when shared. If you catch something it’s always awesome to share a picture or video with your friends. I like using a GoPro, but most smartphones are more than adequate for capturing awesome pictures. If you’re going to be out during the mid to late afternoon then it’s helpful to have a pair of sunglasses so you don’t stare directly into the sun without UV protection. Polarized lenses are great for reducing glare out on the water. Make sure if you’re going out during the day that you wear ample sunscreen and apply liberally. You don’t need to get unnecessary wrinkles from the sun. 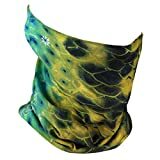 Looking for a quick pick fishing mask to get started? Another great option is picking up a quality fishing mask. These wrap around your face and protect you from the sun and even the wind. Windburn is a real thing and can leave your face red and in pain! If you’re going to be out for more than a few hours, do yourself a favor and bring some snacks and water to stay hydrated. It’s important to know how to rig a fishing line so you’re not stuck out on the beach looking like a noob. Make sure you have all the gear ahead of time so you can enjoy your time without worry. The simplest rig for surf fishing is the Carolina Rig. It’s the setup for someone who wants to get out in the surf, get wet, and fan cast all over the place. It’s comprised of a slip weight with optional colored bead, swivel, leader, then a hook with an attached lure or bait. For most surf conditions you’ll need a ½ oz weight, but feel free to opt for a ¾ or 1 oz if the waves are larger. The best bait to throw on your hook for this setup is a Gulp! 2-inch camo sandworm, Big Hammer perch Grub in Motor Oil Red Flake or a live sand crab. Place a ¼ to 1oz weight at the end of your leader. Bell sinkers work well. 12 to 14 inches above the sinker attach a hook using a Palomar knot. You can then place a soft lure that looks like a fish on the hook. Hook the other end of the leader line to your swivel and you’re ready to go. When you cast out to keep your rod at 9 o’clock and keep the line tight. As you reel it in moves your rod between 9 and 12 o’clock to have the lure flutter up and down realistically. Most of the time a Carolina rig will get the job done, but sometimes if you’re having a hard time you’ll need to spice it up and this rig might just land you a Halibut. Worth a shot! Make sure you have the proper fishing license and ocean stamp for your state or country. No need to get in trouble doing something fun! If you’re in the States, pick up your fishing license here. 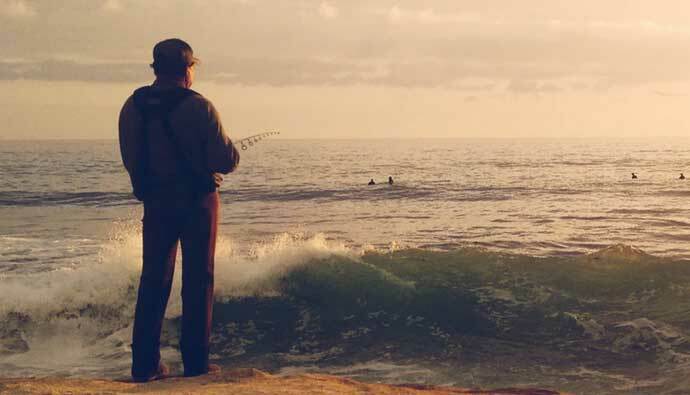 A: Surf fishing is fishing in the ocean offshore. You use a saltwater pole, reel, and tackle and cast off as far as you can and wait for a fish to bite. You can use a long rod to get your bait far out and wait for the big fish or you can use a smaller setup and fan cast up and down the shore looking for smaller fish. Q: What size hook for surf fishing? A: It’s always good to have multiple size hooks at your disposal, but having sizes between 4 and 8 seem to cover most of the basis. Just make sure you get different types such as the mosquito, bait keepers, etc. A: A surf rod is a fishing pole that you use in the ocean. Most surf rods will be between 7 – 15 feet depending on the style of surf fishing you’d like to do. Shorter is better for fan casting and longer is better for casting far out beyond the breakers. Q: What size reel for surf fishing? A: This all comes down to personal preference and the type of fish you’re going after. For most fan casting situations, 2500-4000 will get the job done. If you need to cast farther you can get a larger reel or use braid line to pack more line on the spool. Q: What bait to use for surf fishing? A: It’s always good to have multiple types of bait depending on what type of fish you’re going after. Many anglers like Gulp! 2 in camo sandworms and Big Hammer Perch grubs. I’ve had lots of success over the years using sand crabs you find on shore. Q: What size rod for surf fishing? 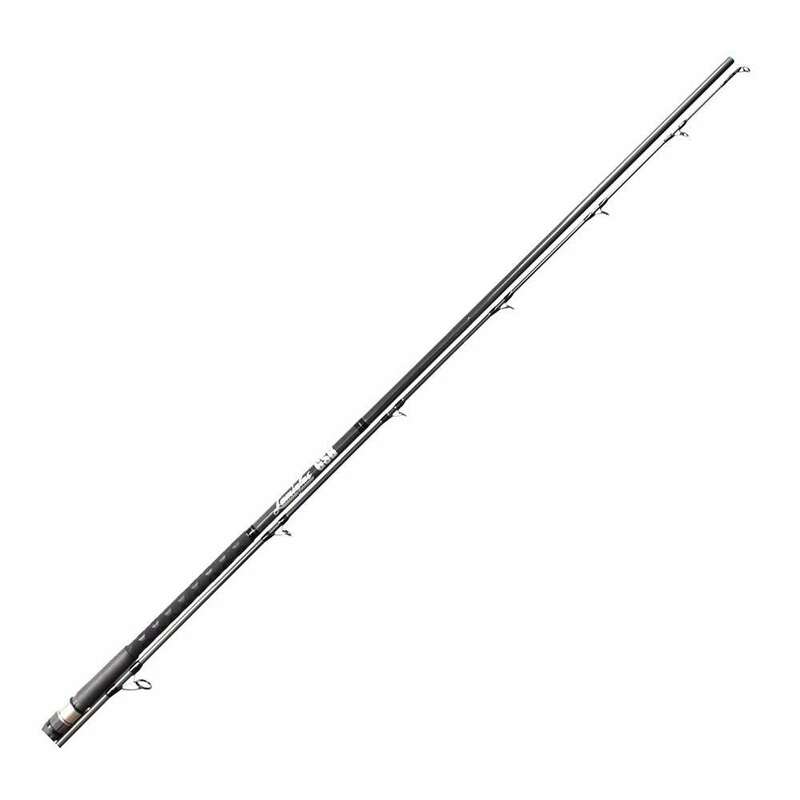 A: It’s recommended to get a 7 – 10-foot rod with medium light power and medium fast action. Q: What pound test for surf fishing? A: This depends on the type of fish you’re going after, but a good test would be 8lb mainline. Monofilament in clear, blue, or green. Your mainline is what’s spun around your spool. Use a 6lb leader line, such as Fluorocarbon, which is clear. If you have a smaller reel, check out 8 – 20 lb braid. Q: What is a shock leader surf fishing? A: A shock leader is used to prevent break-offs during the cast. Once you’re able to start casting with enough force to actually achieve some distance, use a shock leader. Swivels tend not to be the weak point, but line and knots tend to give with force. Q: What tackle to use for surf fishing? A: Live bait, cut bait, soft and hard lures. Q: What do I need for saltwater fishing? A: A fishing rod, reel, line, tackle, and a fishing license. 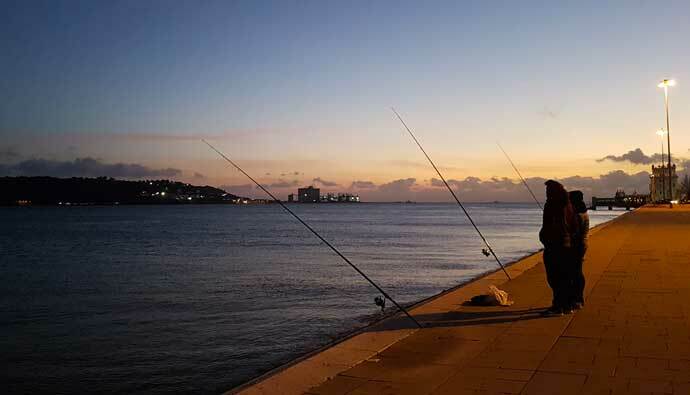 Q: What is the best line for surf fishing? A: It’s recommended that you mainline with braid then top shot with mono and use a fluorocarbon leader. Q: What line to use for surf fishing? Q: What size weight for surf fishing? A: Use between ½ and 8oz weight depending on how far you want the cast and the equipment you’re using. Q: What is a good rod and reel for saltwater fishing? A: For fan casting use an 8’6” SST with a 2500-3000 spinning reel. For further casting use a pole 10-15ft long and an 8000 or greater reel.